A baby's teeth start to form during the first trimester of pregnancy, and a child's first tooth typically erupts between six and nine months of age. These developmental facts show the importance of dental health from the very beginnings of a child's life. With proper dental habits, your kids can have healthy smiles as they stop enamel cruelty. 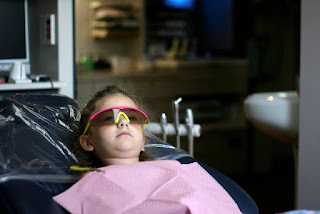 Here are seven ways I've encouraged my girls to embrace healthy dental habits. Even though babies don't have teeth, it's important to wipe their gums with a clean washcloth or damp gauze after every meal. This practice keeps your baby's gums clean and establishes good oral hygiene habits. When my girls first learned how to take care of their teeth, we brushed, flossed, and used mouthwash together every morning and every night. They each used a character toothbrush as we raced a timer, fought plaque monsters, and had fun. With this practice, my girls learned the right brushing techniques, like reaching every tooth surface and using only a pea-size dollop of toothpaste instead of the whole tube. They also learned to be consistent with these important oral hygiene habits. Kids should visit the dentist around their first birthday or within six months after their first tooth erupts. My dentist told me that this visit gave her a chance to assess tooth decay risk, check for cavities, and answer any dental hygiene questions a parent may have. After that initial visit, continue to schedule regular dental check-ups. Your child should visit the dentist every six months to ensure oral health. Soda and juice are filled with sugar and acid that can wear away your child's tooth enamel. Limit sugary drinks and serve water instead as you protect your child's teeth. If you want to give your kids sugary drinks, reserve these treats for special occasions, use straws to limit the tooth's exposure to the sugar and acid, and rinse with water afterwards. The right foods clean teeth and strengthen enamel. I try to feed my girls these foods regularly. Serve your kids apples, carrots, and other crunchy fruits and vegetables because they clean teeth. Cheese, meat, nuts, whole grains, and green vegetables are also smart food choices since they contain strengthening vitamins and nutrients. Avoid candy, bread, potato chips, and other foods that are high in sugar or stick to teeth because they contribute to tooth decay. Whether you're a teacher, caregiver, or parent, you can advocate for dental hygiene classes at your child's school. Ask a dentist or hygienist to visit your child's classroom and teach proper brushing techniques, or encourage the school to invite a mobile dental clinic to give kids check-ups and cleanings. My girls know that I take care of my teeth and see the dentist regularly. As I model good dental hygiene, I teach them to practice these same habits. When you encourage healthy dental habits in children, you stop enamel cruelty and equip your kids to have a healthy smile for the rest of their lives. What other tips have you used to encourage your kids to take care of their teeth?